We’d love your help. 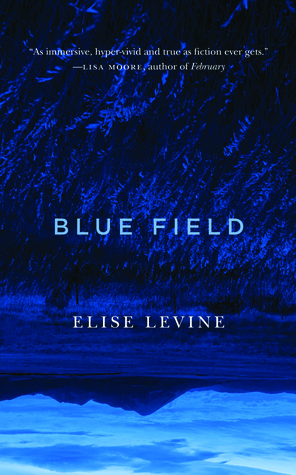 Let us know what’s wrong with this preview of Blue Field by Elise Levine. When her friend Jane dies while exploring an underwater cave with her husband Rand, Marilyn takes up diving again, to honor—and outdo—her late friend. Marilyn drags Rand with her as she increasingly pushes herself far past her limits and skill level, endangering them both in their private underwater version of hell. Recalling the best of Mary Gaitskill and Lidia Yuknavitch, When her friend Jane dies while exploring an underwater cave with her husband Rand, Marilyn takes up diving again, to honor—and outdo—her late friend. Marilyn drags Rand with her as she increasingly pushes herself far past her limits and skill level, endangering them both in their private underwater version of hell. Recalling the best of Mary Gaitskill and Lidia Yuknavitch, this gripping, tense novel explores the tangled lives of three driven risk-addicts—deeply flawed people bound and propelled and ultimately unraveled by desire, loss, and guilt. Driven by character, foregrounding language and form, at times fabulist and dystopic in style, the novel's heightened sexual atmosphere and psychological distress immerse the reader in a world of unforgettable depth and darkness. To ask other readers questions about Blue Field, please sign up. Brilliant, unforgiving story of a woman desperately spinning through grief, caught up in the world of risk-taking divers, intent on pushing herself beyond her limits to prove she is alive. The language is exceptional; Levine balances stunning poetic turns of phrase against a harsh, intense narrative as her protagonist, and the relationships around her, unravels under the strain of a series of devastating losses. A longer critical review will be published at the end of November. If there is one reason to read this book, it's the writing style. Unique among authors I read before, I found it to be very lyrical; flowing like the shades of blue our main character sees over the course of the novel. Despite that, I didn't really enjoy the overall plot of the story itself, and while the detailed descriptions of deep diving were realistic, over time I found the whole experience to be quite fatiguing. Worth a read, but not as thrilling as I expected it to be. Virginia Woolf and Christine Schutt got hitched, and Blue Field is their child. To stretch the metaphor: I love this kid. In the sonic impact of each line, Schutt echoes. The ability to capture simultaneous moments of consciousness cries Woolf. Example: "The breeze sifted the needles on a stand of spindly pine. A tourist trading post then a gas station emerged by the side of the road--tricks, she thought. Ruses to convince her the truck wasn't rolling in place while the surround peeled like rind. Virginia Woolf and Christine Schutt got hitched, and Blue Field is their child. To stretch the metaphor: I love this kid. In the sonic impact of each line, Schutt echoes. The ability to capture simultaneous moments of consciousness cries Woolf. Example: "The breeze sifted the needles on a stand of spindly pine. A tourist trading post then a gas station emerged by the side of the road--tricks, she thought. Ruses to convince her the truck wasn't rolling in place while the surround peeled like rind."